In this series, the intricacies of a leafs veining are recreated by wrapping, stitching, and knotting together strands of human hair. 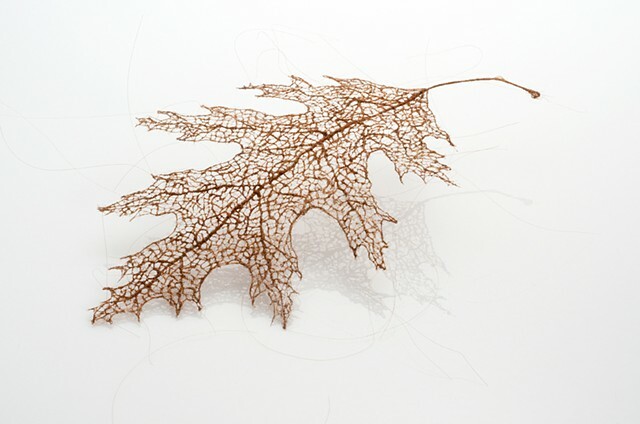 Inspired by the delicate and detailed venation of a leaf, I began stitching individual strands of hair by hand into a water- soluble backing material. At each point where one strand of hair intersected another, I stitched a tiny knot, so that when the backing was dissolved, the entire piece was able to hold its form. Creating this work was a very meditative process for me, as I found myself lost in the detail of the small, organic microcosms that began taking shape. The complex network of lines present in this work mimics the organic patterns found in nature and speaks to the natural systems of transformation, growth and decay. Allusions to the vascular tissue of plants, as well as the vascular system of the human body, exist simultaneously; the delicate trace of a hair falling silently, imperceptibly, from ones head becoming the veins of a leaf as it falls from a tree leaving its indelible imprint on the ground below.